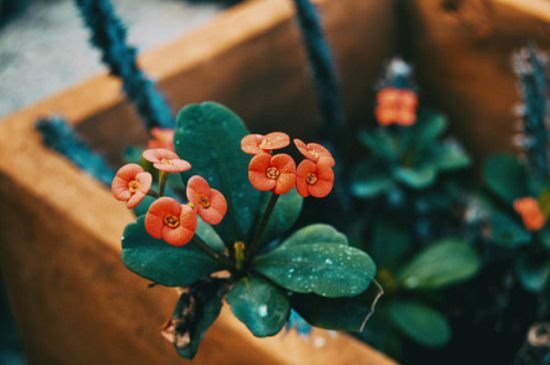 Crown of Thorns Plant Care is not difficult, and it rewards you with its never-ending colorful blooms. Find out everything in detail in this Growing Crown of Thorns guide. 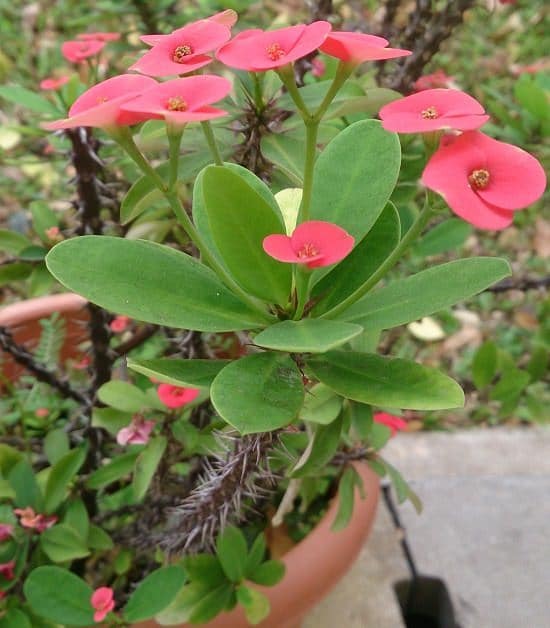 The Crown of Thorns (Euphorbia milii) is an evergreen succulent that produces colorful bracts of red, pink or orange colors around the mini flowers like the poinsettia, continuously. It’s named Crown of Thorns due to a legend that the Thorny Crown of Jesus was made from this plant’s stems. 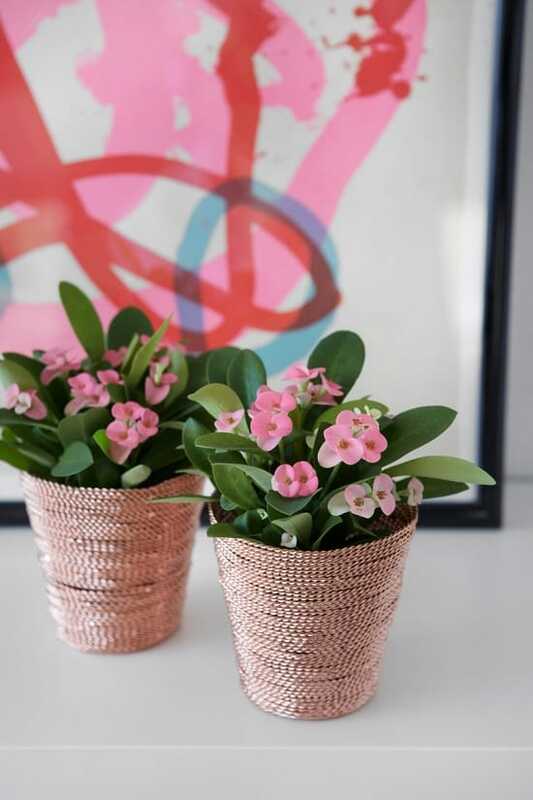 This easy-care succulent houseplant is originated in Madagascar and can be grown indoors year-round in any part of the world. In areas with frost-free winters, growing Crown of Thorns outdoors is possible. It is an ideal outdoor plant for tropical, seaside locations since the plant thrives in a salty environment. It also handles drought so well, perfect for dry regions with water scarcity. The Crown of Thorns can reach a mature height of 5 feet. The thick stems are covered with one-inch long spines that are really sharp to touch. New plant growth has a few narrow, green leaves, but the leaves reduce in numbers as the stems age. The succulent plant blooms year-round in a warm climate. In cold climate, it flowers when the weather starts to warm up, usually from spring to fall. Bright, warm colored bracts appear on the top tips of the stems, surrounding tiny flowers. If you have one Crown of Thorns, chances are you’ll want more. Their easy-care nature and beauty make them a highly desirable plant. Fortunately, they are also easy to propagate, so you have as you want. Take cuttings from the new stems in early spring. Dip the cut end into warm water for 5 minutes to stop the sap from running. Place cut pieces of it on a paper towel and allow to dry for 3-4 days or until a callus forms over the cut end. Fill sand in a container and moisten it. Place the calloused end of cuttings in the sand and set the container in a warm but shaded location for four weeks. Gently tug on the pieces at the end of 4 weeks. If you feel resistance, they are ready to be re-potted into a permanent container. If the pieces lift out of the sand with no resistance, they have not developed a sustainable root system and needed to spend a couple more weeks in the sand. An alternative and straightforward method for the crown of thorns propagation is–Dip the cuttings in rooting hormone and plant them directly in potting mix. Keep the plant in a bright and warm location that is shaded. Precaution: Use gloves when working with this plant. Plant’s sap may cause skin rashes or irritation and thorns may prick. Start a young plant in 6-8 inches pot. When you’re repotting an old crown of thorns plant, select a pot that is one size bigger than the previous pot in which it was growing. If you’re growing crown of thorns outdoors, choose a sunny location that is windy. 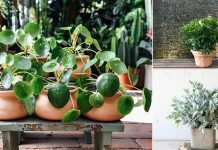 When growing indoors or on a balcony, locate it near the Southern or Western window, where it can receive part sunlight to full sunlight and proper air circulation. In can tolerate shade as well, but grows poorly without flowers. Tip: It’s a great low care plant for dry, windy, and coastal locations. Crown of thorns (Euphorbia milii) is not picky about soil, as long as it is light and drains well. 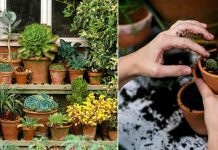 Succulent or cactus soil mix of gritty and light texture is the best. 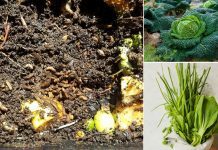 Although it can grow in poor soil, you can still add a small amount of compost and organic matter at the time of planting. It is a drought tolerant plant that stores water in its thick stems, which means it doesn’t need regular watering. Infrequent and occasional but deep watering is required, only when the top 2 inches of soil is dry. 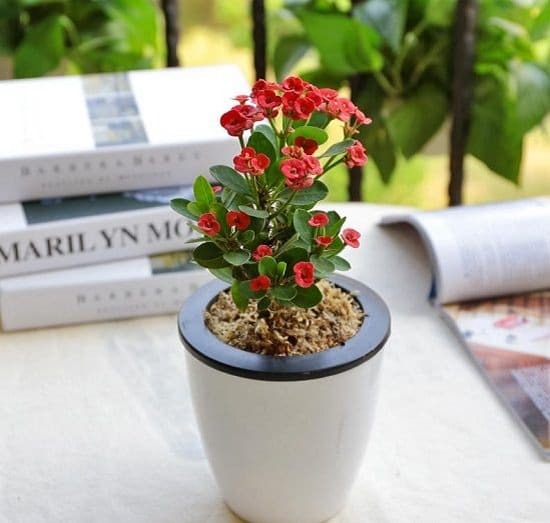 Keep this plant on a drier side to get more blooms but do remember that too much lack of water for a long time causes the leaves and blooms to fall off from this plant. Tip: If you’re growing crown of thorns in a cool climate, reduce watering in winters. The plant does well in lack of nutrients and usually go on without fertilizer when growing on the ground. Though in container culture, it requires fertilizer but in a small amount. Apply quarter (1/4) strength balanced liquid fertilizer every month in the spring and summer. In hot climates, you can fertilize year round. If you’re using granular fertilizer, feed the plant once in 3 months. Note: Reduce or increase the fertilizer strength according to your plant’s requirement. Tip: Feed the plant with a fertilizer that is boron-free or has low levels of this micronutrient. Crown of Thorns is extremely sensitive to increased boron levels in the soil. This is a desert plant and prefers warm growing conditions. Temperature above 65 F (18 C) is optimal for its growth. In cold climates, when the temperature goes down, the crown of thorns starts to slow down its growth or become dormant. Crown of Thorns plant doesn’t care about humidity levels and grows well in the dry air. Tip: Keep it away from cold drafts, frost, and freezing temperatures. Crown of thorns can live pot bound for a long time. If you want a show of continuous blooms, keep it slightly pot bound. Repotting should be done when the plant has outgrown the pot. Crown of thorns is a slow grower and doesn’t need pruning for a couple of years. Pruning is best done in the dry and cool weather to avoid any stem disease. Usually in early spring and spring, just before the new growth starts. Caution: Beware of its milky sap and thorns, wear gloves when pruning the plant. Remove leafless, crowded, and tangled stems at the end of the growing season with a pair of sharp snips every year. In more compact varieties, thin out the overpopulating branches at the base to allow adequate air circulation. 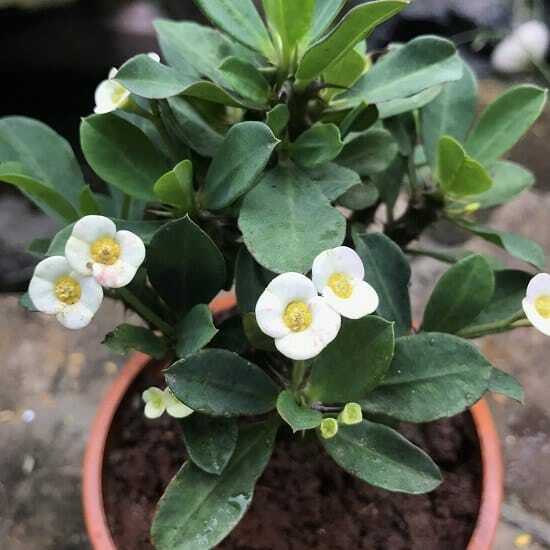 If left unpruned, the crown of thorns keep growing vertically, but to maintain its shape and size and a nice fuller but well-maintained look, pruning is required. Prune off the branches back to the axillary or lateral buds. In more simple words, look for the green buds or emerging growth on the crown of thorns branches and cut just above them leaving the green buds intact. Do this once in every couple of years in late spring, if you want a bushier growth. This video of Martha Stewart will give you a little more idea about pruning crown of thorns. Tip: If the plant has damaged, diseased or dead branch, and develops brown leaves and stems any time of the year, prune them back to healthy plant growth. The brown part is a plant rot, and it may spread if not pruned off. Pests are not a serious concern for this plant. Mealybugs, scales, and spider mites can cause a little problem occasionally. Crown of thorns usually dies due to diseases caused by moisture. Overwatering, wet leaves and stems, and lack of air circulation must be avoided. Precaution: The latex of Euphorbia milii is toxic and thorns are spiny, which can cause injury. Keep this plant out of the reach of children and pets.